Since 1953, when Japanese television went on air for the first time, television dramas have played a central role in affecting and reflecting on Japanese society, its identity, and its relationship with others. Japanese television drama traditionally concentrated on the everyday life of “everyday” (urban) middle class families, Japanese minorities and foreigners remaining very much outside its focus. This lack of focus on the diversity inherent within Japanese society can, in turn, be seen to have contributed to a variety of other reflections on the nature of Japanese society as a homogeneous cultural zone. Indeed, it could be suggested that Japanese television dramas have helped to underpin and reinforce a ‘myth of homogeneity’ of the Japanese people—a myth also propagated by the nihonjinron (theories on the uniqueness of the Japanese) writing of the 70s and 80s. The 1990s, however, saw an increase in foreigners from other Asian countries entering Japan. Other events, such as the end of the Cold War, have served to change the nature of the three-way inter-dependant relationship between Japan, the West and Japan’s Asian neighbours. With the West ceasing to be the main point of reference for Japan’s self-image, Japan’s Asian neighbours have expanded their economic and political relevance, potentially challenging the ‘self-reference Other’ position of Japan in the world. With ‘Asian’ artefacts and travel destinations becoming gradually more popular, Japan can now be seen to have entered an ‘Asia boom’ era in terms of its popular culture. This reorientation of the ‘Asian Other’ has, we will argue here, begun to challenge the construction of Japan as a homogeneous country. This trend is perhaps first visible in Japanese cinema which has, since the late 1980s, featured growing numbers of ‘Asian’ characters, taking up the problems of a more regionally relativized society. Japanese television dramas, the subject of this chapter, followed suit approximately a decade later. The aggregative effect of such changes in the reflections on the nature of Japanese society in popular culture, may, we argue, present a possible future where this notion of homogeneity becomes not merely questioned, but potentially almost completely overthrown. Japanese television dramas are often praised for their (perceived) closeness to reality—they are seen to be much more than just mere ‘products of entertainment’ within Japanese society. As Penn points out: “TV dramas provide a window into Japanese society that can be more revealing than a sociology textbook” (Penn 2003: 14). Thus, as Japanese television dramas began to show more characters from other Asian countries, and a more heterogeneous image of society seems to have come gradually accepted within that genre, the appeal for acknowledgement and acceptance of such an image has gone out to the very ‘grass roots’ of Japanese society. While from 1954 until 1994 only five television series featured characters from other Asian countries in leading roles, between 2000 and 2002 it took only two years to achieve the same number of television series, while at the same time, many television films dealing with ‘Asian’ encounters were broadcast. The rise in the number of foreign, especially ‘Asian’, characters is therefore highly visible, powerfully reflecting the entry into the recent ‘Asia boom’. The Football World Championship co-hosted by Japan and South Korea in 2002 furthered the interest in South Korea, a region also growing in popularity in (Japanese) TV dramas. In 2003, the Korean TV drama “Winter Sonata”, one of the first ever on Japanese small screens, became enormously successful and sparked off a ‘Korea Boom’ (hanliu) in Japanese popular culture which continues today. As the ‘Asia boom’ in Japanese television dramas mainly concentrates on characters from ‘China’ and South Korea, the focus of this article will be on dramas featuring characters from these two countries/regions. Before analysing several television dramas depicting encounters with Korean or Chinese characters, we will give a short overview of common patterns used in the creation of the imagery of these two other Asian countries. We will hope to illustrate how the way in which ‘Asian’ characters are constructed and given meaning within these dramas reveals a great deal about Japan’s present and possible future cultural, national and regional identities. More specifically, we shall be analysing the way in which these small screen encounters with other Asian characters illustrate how ideas of Japanese culture, identity, and self-image are in a phase of significant renegotiation, and again may come to help re-define immediate and long-term possible Japanese futures. According to the analysis of media researcher Werner Faulstich, the ‘Other’ in international film is constructed around notions of “exoticism”, “salvation” and “horror”. While exoticism represents “the unknown to be discovered” (Faulstich 1996: 414), salvation positions the ‘Other’ as something to be desired and to seek out for salvation of the self (Faulstich 1996: 417). Lastly, Horror literally portrays the ‘Other’ as “sinister, threatening, even frightening” (Faulstich 1996: 418, English translations by the authors). These patterns of appropriation and othering are very much in existence in portrayals of Asians in Japanese television dramas as well as in other popular genres. However, the degree to which “exoticism” “salvation” and “horror” are respectively employed has changed over time. While in earlier television dramas the patterns of exoticism and horror prevailed, in more recent productions the pattern of salvation has gradually become more dominant—often assuming the shape of Japanese ‘nostalgia for Asian modernising energy’ (see Gatzen and Gössmann 2003: 247). Modern individual vs. Traditional familial. Japanese are constructed as individualist and ‘modern’ in contrast to family-oriented and thus ‘traditional’ ‘Asian’ characters. Displaced unmotivated vs. Grounded empowered. The ‘Asian’ characters are constructed as pursuing their (often creative) life dreams, whereas the Japanese seem to have few goals. In the course of cross-cultural encounters, the Japanese are shown to be inspired to define a goal in life as well. Metaphysically and emotionally under-resourced vs. Spiritually endowed. The ‘Asian’ characters – with an energy and vitality to overcome difficulties and achieve life success – serve as role models, even saviours, to Japanese presented as lethargic and unmotivated. They are thus being utilised in order to provide a vital impulse for the development of the Japanese characters. We would now like to analyse the small screen encounters with Korean and Chinese characters, illustrating how these constructions of ‘Asian’ characters represents an attempt to overcome, or to speak about, struggle in each paradigm. The most predominant struggle, which weaves its way through many of the portrayals and storylines, is the first in the list above—the need to portray ‘Asian traditions’ and family values in Korea/China in a particular way in order to illuminate the need for Japan’s salvation in this area. Analysis of the “Modern Individual vs. Traditional Familial” will thus take up the majority of our discussion. The second two paradigms, one involving the degree to which individuals are able to find a sense of place and motivation in society, the ‘Other’ gesturing to a spiritual and emotional capacity to face-up to and overcome problems, have obvious overlaps. We therefore propose to turn to deal with these two points of struggle under one heading: “Nostalgia for Asian Energy”. The notion of Asia as sharing common ‘traditions’ is one popularised by several Asian politicians and controversially discussed by scholars throughout the past decade. Be it Ishihara Shintarō or Mohamad Mahathir, these so-called ‘Asian values’ have frequently been referred to in order to distinguish Asia from a fundamentally different West. In this context, ‘Asian values’ are often reduced to ‘Confucian values’ which in turn are understood as placing greater value on the benefit of the group or the family than on that of the individual. This is perceived as the main distinction between a homogenized Asia and its (equally homogenized) ‘Other’—a degenerating West. The construction of this clear-cut opposition sparked a lengthy debate and fuelled the production of countless publications in the fields of journalism and scholarship—both in Asian and Western countries. Although it can be said that contemporary Japanese television dramas do raise socially relevant questions, they in fact tend to avoid politically controversial topics—the ‘Asian values’ debate is therefore not referred to explicitly. In the this section, however, we intend to illustrate that the portrayal of ‘Asian’ characters as family-oriented can in fact be regarded as a contribution to this debate. As we will hope to reveal, the Japanese and other Asian characters are constructed in deliberate opposition to one another for the purposes of contributing to the themes of this debate. Indeed, we often see that the Japanese assume a part hitherto reserved for ‘individualist Westerners’, implicating Japanese society in a Westerner-like devaluation of the family (the frequent occurrence of divorce being one of the signifiers). In contrast, non-Japanese Asian characters are – almost without exemption – constructed as clearly family-oriented and presented as living according to the so-called ‘Asian traditions’. Indeed, nowhere does the representation of family values find greater issue within Japanese television dramas than the small-screen encounters with Korean characters. This attitude might not seem surprising when one considers the common stereotype that it is in Korea, rather than China, that Confucianism still plays an important role in structuring familial relations. However, it is also obvious in these dramas that the comparison with Korea underscores the construction of Japan as being particularly ‘modern’ and therefore ‘Western’ in its emphasis on individual freedom and choice. All dramas portraying Korean characters are characterised by the Japanese side consisting of ‘modern’ families with an independent and successful working mother. As a result of these reprimands, Rie withdraws herself from her Korean surroundings, which in turn becomes one of the main sources of criticism of Omoni and other Korean neighbours. They claim that she “does not open her heart to Korea” (kokoro o hiraiteinai). From a gender point of view her withdrawal can be seen as a kind of (conscious or unconscious) self-protection of her identity as a working woman. To continue working, she guards herself against the country which seems to threaten her own self-fulfilment—important for her, but seemingly worthless in Korea. Gender issues thus become a central pivot on which the intercultural encounter between Korea and Japan is explored and commented upon. After professional failure – one of her sketches is rejected – Rie’s role as wife and mother is brought entirely to the foreground. Likewise, when her mother visits her in Seoul, Rie becomes aware of her duties as a daughter and realises that she has neglected her mother – and her own family – for a long time. The construction of a dichotomy of Japan and Korea concerning gender and family roles is complimented by a subsequent presentation of the idea that inter-generational conflict can unite the generations across cultural borders. Rie’s mother and Omoni understand each other’s values and worldviews well, and Rie and Omoni’s daughter – both of about the same age – are united by their wish for professional self-fulfilment. However, even though these changes within the younger generation in Korea are observed – personified by Omoni’s daughter – Korea is presented as a country in which women have to dedicate themselves first and foremost to their families. Significantly, the only woman with professional ambitions is Omoni’s daughter who is divorced and without children—a source of constant reproach from Omoni who can be seen as a representative of the elder generation. The Japanese-Korean television film “Friends” (in two episodes, TBS 2002, No. 4), despite being a co-production, also draws heavily on the stereotype of Korea as a Confucian country by emphasising the same (perceived) difference in family values. Here, the emphasis of family values in Korea can be seen as not only a construct of the Japanese producers, but can also be seen to have become part of Korea’s self-image. “Friends” is a love story between the male Korean character Jihun and the female Japanese character Tomoko. According to the producer at the Japanese private station TBS, the Japanese production team aimed to “emphasise the difference between Japanese and Korean families.” For this reason, the Japanese and Korean characters were provided with entirely different backgrounds: the Korean, Jihun, has been born and raised in a rural province which is – even in Korea – considered to be exceptionally ‘traditional’; while the Japanese, Tomoko, is the daughter of a single mother from the Tokyo megalopolis. Therefore, by juxtaposing the heir of a ‘traditional’ Korean family with a girl from Tokyo, the perceived distinction is much more obvious than if the two main characters were chosen from a similar environment. This difference in backgrounds and upbringing eventually lead to a clash between the two main characters. Although Jihun dreams of making films, his father wants him to take over the family business. Tomoko, on the other hand, has no concept of obligation to the family in terms of her career directions. Her mother has been constantly concerned whether Tomoko had dreams or ambitions she wanted to fulfil that her mother could help her accomplish. As she always had to reply that she did not have a ‘dream’ for herself, Tomoko puts high esteem in people that, in contrast to herself, do have dreams in life. When she urges Jihun not to deny his film-making dream for the sake of his family’s business, Jihun defends his father’s position. Nevertheless, it is important to note that Tomoko’s Japaneseness plays a part here—in identifying Korean culture as an underdog to the Japanese, Jihun seeks to defend and uphold his own country’s culture in the face of the Japanese ‘Other’. Towards his Korean friends, however, Jihun is much more critical of his father and the family traditions. Such intimate disagreements thus represent the negotiation of power balance on large cultural and national canvases (Iwata-Weickgenannt 2008). Although they remain together, Tomoko withdraws emotionally from Jihun who eventually continues to realise his dream to work in film. In “Friends” the common patterns are reversed—even though the Japanese character is able to find a new job in which she can be more at ease with herself, it is not she who is encouraged to live her own dreams, but the Korean character. When Jihun wins a prize for one of his films, his father finally accepts his professional ambitions. When his father then goes on to give him permission to marry Tomoko, the film is brought to a happy ending. Yet, even though differences between the younger and the older generation are emphasised, it is much more important for Jihun than for Tomoko to live in accordance with his family’s wishes. Like in “Kankoku no obachan wa erai”, the world view of the younger generation differs from that of the elder. However, in the argument with Tomoko, the Korean character describes it as given that he should seek to fulfil his father’s expectations. Even though – encouraged by Tomoko – he decides in favour of his own professional dreams, the harmony with his family is vital for him. By contrast, Tomoko’s relationship with her mother is based on friendship rather than obligation. Her mother even encourages her to find and eventually realise her own dreams. Thus, the contrast between Jihun and Tomoko’s familial worlds is a powerful signifier for the construction of Japanese and Korean cultural difference and identity within the drama. The television series “Faitingu gāru” (Fighting Girl, Fuji TV 2001, No.5) which consists of eleven episodes, portrays a friendship between the 19-year old Japanese Sayoko and the 24-year old Korean Ami whose attitudes differ diametrically. Ami’s moral concepts match those of Sayoko’s father who owns a small manual workshop and thus personifies a more ‘traditional’ Japan. When Sayoko for a short time enters the fashion business, her father strictly opposes her plans to work in such a fast-moving branch. 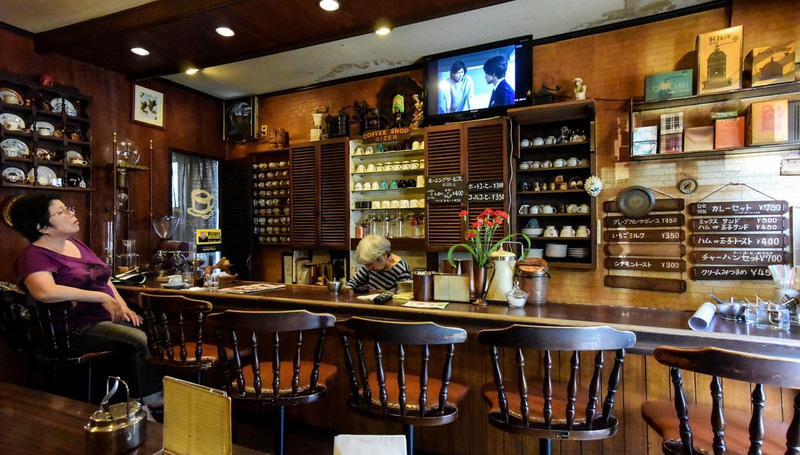 His own small family business, however, seems to be associated with a ‘not-quite-as-modern’ Japan. Therefore, through this representative of the elder generation, a more critical stance toward Japan’s modernity is put forward. Due to her friendship with Ami, Sayoko eventually realises that the ‘traditions’ upheld through her father’s small business are in fact something valuable to be respected. Japanese and Korean families in Japanese television dramas are almost always constructed along the ‘tradition versus modernity’ dichotomy, even when internal inter-generational differences and cross-cultural generational symmetry can be detected and convincingly rendered. The comparison with Korea serves as a means to present the situation in Japan as being far from any Confucian, shared Asian, family traditions. Even though it is made clear that the younger generation in Korea seem to suffer from the limits set by these traditions, family values in general are presented as something positive, something that relate to Japan’s own ‘traditions’—traditions diluted or even destroyed in part by the effects of ‘modernization’. As the previous focus on Korean characters makes clear, Koreans are nearly almost presented as upholding a ‘traditional’ lifestyle by placing emphasis on family values. Unlike those dramas portraying Japanese-Korean encounters, however, the dichotomy of ‘traditional’ versus ‘modern family life’ seems to be of lesser importance for the construction of ‘Japan’ and ‘China’. Although only two dramas deal with the issue of tradition and modernity between China and Japan, this dichotomy is conveyed in a very fascinating and revealing way. In Sakuranbo no minoru tani, (The Valley where the Cherries Bear Fruit, NHK 2000, No. 6), a young Japanese salary man encounters life in a minority village in a remote Chinese province. This particular minority, especially the family he befriends, is presented as having led a life far from the benefits and losses of ‘modernity’ which is posed as spreading throughout China and about to reach the secluded village. This ‘modernity’ is represented by two Japanese characters who are planning to bring tourists into this area and therefore need to prepare the village according to the needs of visitors from a ‘modern’ society while at the same time trying to preserve the village’s ‘primeval flair’. The drama sets out to convey the notion that the contact with this kind of ‘modernity’ will slowly degenerate the ‘original traditions’ of the villagers. This is personified in the character of one of the Chinese family’s sons who works in a Japanese company. Even though the ‘traditional’ codes of honour demand that all family members stand together in a moment of desperate need, he refuses to help his family by saying: “There’s no need for traditions. We live in modern times now.” His sister, on the other hand, sees the necessity to preserve the minority’s lifestyle. She considers it her duty to remain in the village and teach the children the true value of ‘traditions’. Through her efforts, her brother is eventually able to reconsider the significance of these ‘traditions’ and finally even turns to help his family. Interestingly, in “Sakuranbo no minoru tani”, the boundaries between a supposed ‘original tradition’ and a ‘newly intruding modernity’ are not drawn exactly along the lines of ‘traditional Chinese’ versus ‘modern Japanese’. ‘Modernity’ rather seems to be something ‘infectious’ and threatening for, (although somewhat nostalgically distorted and woolly defined), ‘traditions’ in general. Whereas the small village in the mountains is presented as having preserved its ‘traditions’ and continually struggling to uphold its codes of honour, the two Japanese businessmen and the son of the Chinese family apparently represent (Western) ‘modernity’ in the sense of thinking only about profit and themselves. Nevertheless, the message of the drama seems to be that this development can be stopped if the ‘modernizers’, be they Chinese or Japanese, are able to find a way back to their own ‘traditions’ again. This is also illustrated by the Japanese main character’s catharsis: The high esteem given to family values within this minority group leads this character to a healing experience such that he is even able to forgive a grudge against his father which has thwarted him throughout his life. Here the approach of the Japanese characters toward ‘tradition’ is clearly visible. Whereas the two Japanese businessmen seek to exploit the perceived ‘traditional’ lifestyle of the minority (economically), the Japanese main character who belongs to the younger generation is able to turn his positive experiences into profit for his personal development, profit on a monetary base becomes unimportant for him. The drama thus conveys the notion that Japan’s younger generation is, or at least should be able to, communicate with China and its inhabitants on a more personal basis, without the ‘corrupting’ influence of economic greed or betterment. “Sakuranbo no minoru tani” can be read as a plea to uphold and cherish a ‘nostalgic-traditional’ lifestyle within a strongly tied family bound by codes of honour as well as by affection. The Chinese characters portrayed as being ‘traditionally-oriented’ serve as role models for the ‘modern’ characters, regardless of their origin.# Referring back to the ‘Asian values debate’, Japan thus takes on the part of the individualised and modern West, whereas rural China is – uncritically – connoted with ‘Asian’ values. “Sakuranbo no minoru tani” thus sports a very essentialist argumentation, as the ‘Western’ qualities of Japan – individualism and a profit-oriented way of thinking – are presented as something acquired (from outside?) and thus easily disposed of in the same stroke. Unlike “Sakuranbo no minoru tani” which shows a construction of China along the conventional pattern of ‘tradition versus modernity’, the ten episode television series “Honke no yome” (Nihon Terebi 2001, No. 7) aired by the private broadcasting station Nihon Terebi, however, takes on a different stance within this dichotomy. Whereas the other examples we have mentioned have portrayed ‘Asia’ as the ‘traditional Other’ to Japan’s modernity, in “Honke no yome” this pattern is reversed by constructing a ‘traditional’ Japan in contrast to a ‘modern’ and international Taiwan. The young female main character of “Honke no yome” – Nozomi – is of Japanese and Taiwanese descent, but was raised in the USA. She thus seems to embody ‘Asian’ as well as ‘Western’ values which are presented in a more positive way than in “Sakuranbo no minoru tani”. So far, Nozomi has led a ‘modern’ lifestyle pursuing a career as a journalist. Her husband is Japanese and the second son of a honke. When the actual heir leaves the family, her husband is asked to fill the role and Nozomi is put under pressure to divorce, because as a working woman she does not fit in the pattern of a usual honke no yome. Instead of submitting to his family’s wishes, however, she decides to stay and fight for her place in the honke. When she discovers that the traditional lifestyle of her husband’s family deprives the members of the family of their innermost wishes, she decides to put a little ‘fresh air’ into the old ways of life. This central point is played out through the role of the Japanese-Taiwanese-American character in contrast to that of her Japanese counterpart—the family matriarch whose task it is to “protect the house” (ie o mamoru). Both are functionalised according to the pattern of ‘tradition versus modernity’. However, as these two women develop deep bonds despite their different attitudes, the ‘traditional’ lifestyle of the husband’s family is gradually changed, allowing the members of the family to experience more personal freedom and the advantages of an extended family at the same time.# Unlike other dramas, here both sides profit from the changes: whereas the family matriarch acknowledges the younger character’s wish to modernise the family traditions and gradually finds out for herself, that “protecting a house” does include the (emotional) welfare of those who live in it, the protagonist comes to respect a traditional way of living. Yet, however progressive this drama may seem in its representation of ‘China’, it is important that the main character is of Japanese descent. She is therefore ‘close’ enough to Japan to at least understand these ‘traditions’, but also educated in the West, thus individualistic enough to question the perceived ‘errors’ of these ‘traditions’ more directly.# The message of the series thus seems obvious: By inverting the common patterns, it is not a yearning for ‘Asian traditions’ that is expressed here, but much rather a wish to cherish Japan’s own traditions (again). Yet it remains significant that common ascriptions of ‘tradition’ and ‘modernity’ are questioned, and an amalgam between ‘old’ and ‘new’ is shown as the most appropriate way of life. Family values, be they ‘traditionally Chinese/Asian’ or ‘originally Japanese’ are in both cases presented as holding relevant ideals and are therefore strengthened as legitimate models. However, the messages are achieved under different preliminaries: Whereas in “Sakuranbo no minoru tani” specifically ‘Asian’ values are portrayed and utilised for the Japanese, the family system presented in “Honke no yome” is entirely Japanese—therefore, a ‘healing process’ can be also found within Japan itself if its own ‘traditions’ are ‘readjusted’. In the genre of Japanese television drama, a certain tendency to describe or construct Chinese as not entirely ‘traditional’ can be observed.# Rather, they seem to oscillate between tradition and modernity. Even in “Sakuranbo no minoru tani”, the ascriptions of ‘tradition versus modernity’ are not drawn along the lines of nationalities. In “Honke no yome”, eventually, this pattern is entirely dissolved. A reason for these divergent representations of ‘China’ may be found in its intense economic diversity—it might be difficult to ascribe ‘tradition’ to the ‘modern’ parts of the People’s Republic – such as Shanghai – as well as to Taiwan which has one of the highest standards of life in Asia. In most dramas depicting encounters between Japan and other Asian countries, the Japanese are portrayed as lethargic and unable to find their own way in life, whereas the ‘Asian’ characters are energetic and full of determination. They usually have a certain dream they aim to fulfil, whereas the Japanese characters are seem to aimlessly wander through their lives. The contact with this ‘Asian energy’ always results in a positive experience for the Japanese, who then are able to define a dream for themselves and consequently become more fulfilled in their new vigour. This ‘Asian energy’ can be seen to manifest itself in different ways. It can either be a determination to work for the betterment of the country or, on a more individual basis, to fulfil one’s personal dreams. This ‘Asian fortitude’ can also be extended to the well-being of the characters’ – mostly Japanese – social/environmental surroundings, therefore obtaining a more altruistic connotation. The pattern of ‘Asian energy and determination’, therefore, illustrates a wide divergence of struggle and application which is best analyzed by looking , in turn, at how ‘dreams of Asian modernisation’, ‘fulfilling personal dreams’, and ‘altruism’ are key sub-themes of this portrayal of energy, motivation and salvation. In the television drama “Doku” aired in 1996, the main character, a Vietnamese exchange student named Doku, comes to Japan in order to fulfil his dream of studying architecture. However, Doku’s own dream was not only to become an architect to have a better life for himself, but to help his own country in its modernisation. The catchphrase of this drama – Asia’s dream will surely come true (Ajia no yume wa kanarazu kanau) – hints that ‘Asia’s’ dream supposedly is one of modernisation and industrialisation, which is reflected in the Vietnamese main character’s own dream. In accordance, the Vietnamese are constructed as more energetic and vigorous than the Japanese who, from their already-modernised position, are fascinated by this power. For the first time, in 1996, the notion that other Asians were more energetic than the Japanese was expressed—a pattern which came to be used more often in the future. It is perhaps important to note that in constructing the ‘Asian Dream’ narrative, it is the progress of a whole state or even the whole region that is emphasised. This is in contrast to the ‘American Dream’ narrative, which usually implies a rise ‘from rags to riches’ focusing on the rise of individuals, and thus in this distinction the ‘Asian values debate’ is again highlighted. In “Sakuranbo no minoru tani” (No. 6), China appears as a country on the verge of modernisation and industrialisation. But unlike in “Doku”, ‘modernity’ is constructed as something that cannot be helped, not necessarily as something desirable. Yet all characters accept the necessity of modernisation by not opposing the intention of the Japanese businessmen to bring in tourists. The most important stance – not raised in “Doku” – is how modernity can be admitted without destroying ’traditional’ values at the same time. Even though the drama focuses on the hazards of a too rash a modernisation, it acknowledges at the same time China’s ‘energy’ which is described as being that of a ‘modernising country’. The approach towards China in the television film “Honkonmyōjōmei” (Fan of a Hong Kong Star, No. 8) also conveys an image of a ‘modernising China’, though only implicitly. The female Japanese main character works as the Asian marketing director of the Japanese branch of a French shoe brand. Her dream is, however, to get rid of the Western fashion dictate and create something ‘exquisitely Asian’ by establishing an Asian label. The creative energy for this she finds in the works of a young female Chinese designer. In this, both the Japanese and the Chinese represent certain abilities: whereas the Chinese assumes the creative part, the Japanese possesses the international competence and entrepreneurial skills necessary to make the product a success. Although this drama never mentions a ‘modernisation’ of China, the ‘Asian Dream’ is extended to the co-operation between China and Japan within Asia—therefore representing a more thorough emancipation of this region. These ‘dreams’ and the ‘energy’ necessary to fulfil them cannot only be found on the national level, as has been briefly highlighted above, but also on a personal level by presenting seemingly lethargic and aimless Japanese characters in opposition to their more vigorous ‘Asian’ counterparts. This is especially visible in television dramas dealing with Korea. These dramas usually contrast a lethargic Japanese character with an energetic Korean determinately working to fulfil his or her dream. Here, the dramas “Mō ichido kisu” (One More Kiss, No. 1), “Shijō no koi” (Highest Love, No. 2), “Faitingu gāru” (No. 5) and the Japanese-Korean co-production “Friends” (No. 4) may serve to illustrate this notion well. Each of these dramas features Japanese characters who at the beginning do not know what to do with their lives. In both “Mō ichido kisu” and “Faitingu gāru” the Japanese main characters have left university before graduating, whereas in “Friends” the main character is unsatisfied with her job as a shop assistant. In all three cases, the encounter with Korean characters give the Japanese the energy to develop an individual dream or to at least reorganise their lives: through the contact with the Korean pop singer, the male Japanese main character in “Mō ichido kisu” is indirectly encouraged to write songs by himself instead of copying others. The Japanese girl in “Faitingu gāru” discovers her talent in fashion design, whereas the Japanese character in “Friends” starts learning Korean, quits her job and starts organising trips to Korea instead: “the passive administrator of consumption thus becomes an active administrator of culture” (Iwata-Weickgenannt 2008, translation by the authors). It is, however, important to note, that in this particular drama the Japanese is as vital to the Korean as vice versa. Only through her doing, the male Korean main character is encouraged to realise his own dream—therefore her ‘female’ energy seems to be as important for him as his ‘Korean’ energy for her. A special form of ‘give and take’ is also visible in the triangular love story “Uso koi” (False Love, No. 9), a series in eleven episodes evolving around the lives of two Japanese and one Chinese character. The young Chinese designer-to-be dreams of becoming one of the pupils of a renowned Japanese designer. For this, she needs a visa, which she obtains by secretly entering the family register of the male Japanese main character as his wife. Although the Chinese character at first glance seems to be a selfish and egocentric person for whom the end seems to justify the means, she is not presented as unsympathetic, but rather as being in a powerless position, a victim of a rigorous Japanese immigration law. The Japanese main character – a photographer – is a creative person himself, and thus understands the Chinese’s motives better than he would actually admit. He gradually gets to admire her determination and begins to support her dream while at the same time receiving inspiration from her. Here, although the Chinese character seems to be the more determined, her Japanese counterpart(s) are by no means lethargic. All of the characters possess a certain creative energy through which they are ultimately able to articulate through encountering each other. In the end, all main characters have found a way to live their own dreams. Within this overall category of ‘nostalgia for Asian Energy’, a certain kind of determination to improve a (seemingly hopeless) situation appears as a common sub-theme. Whereas the Japanese characters presented in these dramas seem to be lethargic and submissive in situations they feel unable to change themselves, the ‘Asian’ characters seem to possess the vitality necessary to initiate change. Strongly related to the sub-theme of fulfilling personal dreams described above, the ‘Asian’ characters here go further in the pursuit of dreams—not just pursuing individual dreams but dreams which may lead to a better life for all. Again, the main arguments of the ‘Asian values debate’ can be found here, as this pattern depends on a more group-oriented, selfless behaviour of the ‘Asian’ characters. In most cases, however, this kind of energy is transmitted to the Japanese characters, whom, after this outside impulse, become more energetic and vigorous themselves. One of the most prominent examples is the main character of the series “Honke no yome”. As already noted, the Japanese-Taiwanese-American main character is functionalised according to the dichotomy of ‘tradition versus modernity’. She therefore does not only represent modernity, but a certain kind of modernising spirit within the traditional honke. Corresponding to her telling name ‘Nozomi’ (literally ‘wish’ or ‘hope’), she strives to help others realise their deepest wishes. In this, she does not seem to have a dream for herself – having realised most of them already – but constantly encourages the Japanese characters to believe and stand for their dreams. Her vitality thus seems infectious, as through her doing, the situation of the family does in fact improve. She becomes the driving force within the household, characterised as altruistic and helpful. The truly idealised character of Nozomi is therefore utilised according to the pattern of the ‘Others’ being ‘saviours’ for the Japanese. Again, however, it is important that she is of Japanese descent, thus rendering the energy not as something exquisitely ‘Asian’ or ‘Western’. This is also underlined by the fact that her Japanese husband in fact shares her determination. Like in “Kankoku no obachan wa erai”, however, the generation gap gains importance, as both Nozomi and her husband symbolise the younger generation, whereas the family matriarch of course represents the values of the elder generation. Though the two worldviews constantly clash, these differences can be consoled by Nozomi’s determination. Another purely altruistic character can be found in the Japanese-Korean co-production “Sonagi—Ameagari no satsui” (Sonagi Murderous Intentions after the Rain, No. 10). The Korean main character is a CID officer who puts all his energy in investigating a case which actually has already been closed. A Japanese businessman in Seoul has apparently committed suicide, yet his sister insists that he has been murdered. Becoming witness to her pleading, he decides to believe her rather than his superiors and starts investigating. Owing to his determination, the truth finally comes to light. The Korean officer is portrayed as a ‘lonesome cowboy’, who neither respects traditions nor superior officers. Although he gives “promotion and ambition” as the main reasons for his actions, it becomes clear throughout the drama that he actually helps the Japanese because of her assurance that her brother is the only family she has – their parents died in an accident when they were still young – and that he promised never to leave her alone. Even though he is by far the most individualist ‘Asian’ character, the Korean seems to have at least a certain understanding of family values. In this drama, the discussion of ‘family’ concerning encounters with Koreans is only implicitly present and strongly reduced in its dominance. “Sonagi” probably goes furthest into the realm of political debate by explicitly mentioning problems between South Korea and Japan. However, it is also made clear that other possibilities for communication beyond politics are possible. In a moment of conflict, the Korean main character states: “The elder generation was right, you cannot trust the Japanese.” In due course however, it is elucidated, that the elder generation was wrong and consequently, the younger generation should able to understand each other on a different level. The Chinese and Korean characters are in most cases presented as the more energetic, determinate part within the plot, although in “Uso koi” – and, to a lesser extent, in “Friends” – the Japanese seem equally energetic. However, the contact with the ‘Asian’ characters is in all cases vital to the development of the Japanese character(s). The other Asians are therefore being utilised according to their relevance for the Japanese. Here, it becomes obvious that portrayals of Asian characters do not show Japan and ‘Asia’ as assuming an equal position. Nevertheless, despite the continuance of notions of ranked economic or cultural power, the ‘Asian’ characters remain as role models for the Japanese. Through a nostalgia for ‘Asian energy’, problems in the Japanese society are addressed and the audiences therefore encouraged to define for themselves goals in life. Conclusion—Youth, popular culture, and a coming asian age? The Japanese construction of the Asian ‘Other’ has been through some important changes. While established patterns and stereotypes do remain, there are efforts at wholly new representations which tap into highly contemporary questions of regional and world place and internal struggles and identities. The ability to blend tradition and modernity, to approach and live life and to embody positivism and energy in one’s pursuit of happiness and success—these are the qualities offered by the Asian characters today. As we have mentioned in various examples, there are also important generational factors at work here too. By conveying closeness between Japan and ‘Asia’ through the relationships of the characters, the ‘rediscovering’ of Japan’s ‘lost’ traditions and qualities is ‘pitched’ to a younger generation. Indeed, almost all ‘Asian’ main characters are young people who represent a young and vigorous ‘Asia’ that has – in various degrees – managed to hold on to its traditions. These young people are carefully constructed and presented as role models for the younger generation in Japan who are seen to be aligned with ‘the West’—their individualism and disregard for ‘family values’ acting as markers for this. Picking up on the antithesis of these Western qualities, elements picked up from the nihonjinron literature and wider ‘Asian values debate’ are utilised to chastise this younger ‘Westernised and passive’ Japanese generation, presenting alternative worldviews and identities, seemingly valued as superior by the older producers. As one producer of a television drama featuring a Korean character put it: the ‘Asian’ characters are there to “tell the younger generation off”. If this strategy should work and the younger generation in Japan is indeed encouraged to be ‘saved’ in the ways that the producers intend, it is interesting to note that their ‘lost qualities’ are also being simultaneously ‘rediscovered’ in the younger generation of their Asian neighbors. This is because these dramas are very much part of a region-wide popular culture, increasingly shared among Korea (since lifting of import controls on Japanese popular culture in 1998), Taiwan, Singapore and Hong Kong (Kondo 2004: 39), to name only the largest markets of Japan-produced popular culture. The role of popular culture itself thus also contributes to this kind of interregional and intergenerational understanding. The younger generation within Asia is presented as consuming basically the same popular culture, one ‘different’ from ‘Western’ and/or American popular culture. The popularity of Korean productions in Japan since the year 2003 underlines this, as Korean dramas and actors seem to have become an inseparable part of Japanese popular culture. While most dramas achieve a happy ending for the (Japanese) characters, the understanding between ‘Japan’ and ‘Asia’ grows in importance. Even though the ‘Asian’ characters are highly idealised personae within these dramas and problems arising in the region because of Japan’s dealing with its wartime past are almost entirely left out, it is the younger generation that is presented as being able to communicate regardless of differences, boundaries, or even politics. Thus, a ‘brighter’ and less troubled future is painted through these dramas—one where shared values to configuring identity and living life override national borders in favour of a shared sense of regional belonging. To what extent will these dramas’ ‘vision’ of a Japan as an integral part of Asia with the region’s youth generation sharing the same values become a reality? There are opposing forces which we see as directing the vision towards and away from influencing the direction of Japan’s possible future. On the one hand, the younger generation is shown as being able to communicate with each other beyond political problems, and this is clearly a model being presented to the very grass roots of Japanese society. On the other hand, however, it remains highly questionable whether a profound understanding can really be achieved by attributing special qualities to ‘Asians’ while offering no substantial treatment of the political differences and nationalist rhetoric that still haunts this region. Ultimately, the vision of the dramas may only succeed if the viewers can look beyond the characters within them to the expanded opportunities they provide for the younger generation in Japan and the wider Asia to engage in meaningful relationships and dialogue with one another. Male Korean main character (27): Police officer, solves the cases despite his superior’s objections.